We’re very proud of our team of vets, nurses, receptionists and support staff. We work over our 3 surgeries, and some of us pop up in more than one! I graduated from Cambridge in 2001 and joined the practice as a locum in 2003. Working life at Culverden – and the great summer that year – convinced me to stay for a little longer, and somehow I’ve never left. I’ve been a partner since July 2012, and enjoy splitting my working time between my home village of Wadhurst and our two other surgeries. I enjoy pretty much every aspect of clinical work and particularly learning new things. I’m a keen “eye geek” with RCVS Advanced Practitioner status in Ophthalmology and take second opinions from my colleagues. I’m one of two Partners in the practice and (although my responsibilities have added a few grey hairs) I’m very proud of the team and facilities we’ve built at Culverden. Outside work I cycle, grow vegetables, tramp about the countryside, read, travel and keep up with my family and friends. I have an inordinately handsome and opinionated white cat, Michael D who features regularly on @CulverdenVets, and a temporary gap in my life where a spaniel should be (watch this space!). I joined the practice in 2000 having spent the previous year travelling the world with my future wife, Ruth. I became a partner in 2005 and assumed responsibility for the Tunbridge Wells surgery when Brian Rosevear retired in June 2008. I enjoy being a good general practitioner practising the art of veterinary medicine as well as the science. I am proud to run an independent veterinary practice when the majority are now owned by corporate business. I am also proud to train veterinary nurses to a high standard as the surgery is a nurse training centre. Although I seemed to have developed a reputation as a feline vet I am equally keen to see dogs! I have 2 Street Katz rescue cats at home: Sally and Linus. Outside of work I am either to be found entertaining my two Skinners’ boys, William and George, or polishing my classic car – a 1965 Mercedes Benz 230 SL. I am also a very keen cyclist, although Geraint Thomas won’t be losing any sleep in the near future! I graduated from Bristol University and joined the Culverden team in 2013. Prior to this I managed to combine my passion for travel and veterinary medicine, working on animal charity projects in both South Africa and India. I have recently gained an advanced qualification, a Post Graduate Certificate in Small Animal Internal Medicine. I am also a keen surgeon and love the variety that general practice is able to offer. In my spare time I enjoy yoga, cooking and spending as much time as possible with family and friends. You will often find me walking around the Kent countryside with my husband, daughter and our Doberman Jake. I joined Culverden in 2017 after graduating from Bristol. My interests include diagnostic imaging, feline medicine and ophthalmology, though I’ve yet to decide my niche! In my spare time I enjoy reading, climbing, photography and spending time with family and friends. I joined Culverden in May 2014. I qualified from University College Dublin in 2007. I have completed an internship at University College Dublin and with Fitzpatrick Referrals, Channel 4’s “Supervet”. 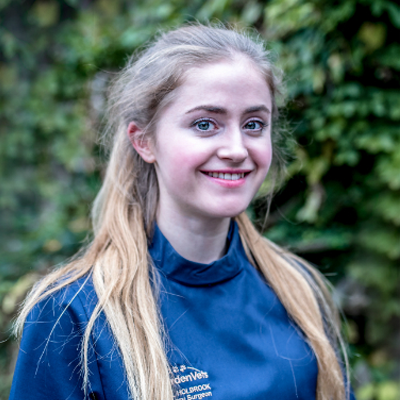 I am working towards a Certificate in Advanced Veterinary Practice (Small Animal Surgery), but I am keen on all aspects of veterinary medicine too. I enjoy spending time with my three daughters,extended family and walking our three rescue dogs. 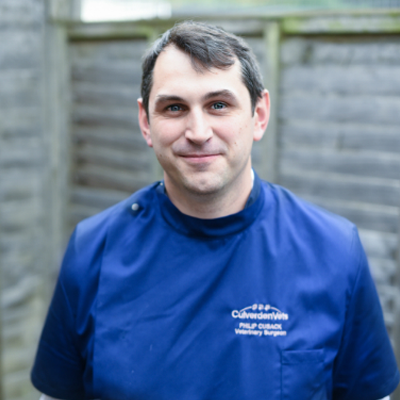 I first joined Culverden in 1990 and was based at the Tunbridge Wells surgery practicing both large and small animal veterinary work. In 1998 after having my first child I moved to the Wadhurst and then in 2002 to Crowborough. 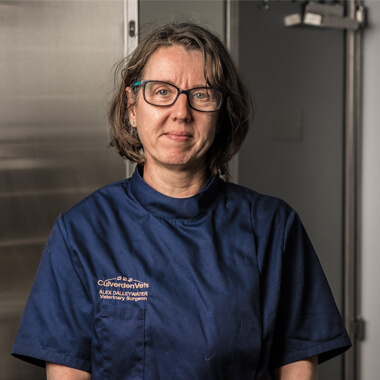 I have a passion for radiography and hold an advanced qualification, the RCVS Certificate in Veterinary Radiology. I have two boys and am married to Duncan, who is also a vet and has his own practice in Brighton. I have a border terrier called Bomber and a border terrier cross Jack Russell terrier called Scramble. I hope to breed from Scramble soon as she is such a lovely little dog! In my spare time I enjoy playing tennis weekly, cycling and walks in the country. Following graduation from Nottingham Vet School, I enjoyed working as a small animal vet at a busy practice in Leicestershire. I moved to Kent with my wife Becca in 2017 so that we could be closer to our families, and I then joined Culverden. I love all aspects of being a vet, with a particular interest in surgery and feline medicine. In my spare time, I enjoy swimming and playing squash, although I’ll admit my serve still needs a bit of work! I have two naughty rescue cats, Bobbin and Pickle, who seem to think exclusively with their stomachs. 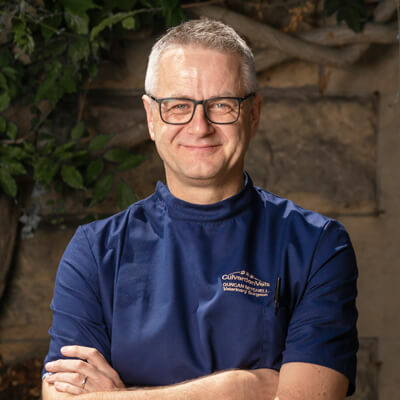 I qualified from the Royal Veterinary College too many years ago to remember now and after a few years in general mixed practice and a sabbatical sailing to and around the Mediterranean, I settled into my niche as a small animal general practitioner in East Sussex. 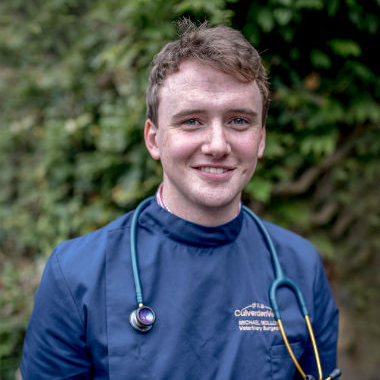 In 2012, I completed the RCVS (Royal College of Veterinary Surgeons) Post Graduate Certificate in Advanced Veterinary General Practice (Cert AVP, VetGP) and in November 2017 I passed, with distinction, the BSAVA (British Small Animal Veterinary Association) Post Graduate Certificate in Small Animal Medicine. I have been recognised by the RCVS as an Advanced Practitioner in Small Animal Medicine. I enjoy the variable caseload in first opinion practice and find something to challenge my skills every day. I live with my husband, who is a Ranger for the National Trust at Birling Gap in the South Downs on a small Christmas tree farm. We have a rescued, working cocker spaniel, Roger the friendly thief, and 2 cats, Sefton and Lola and several chickens. We are currently planting new orchards and developing a forest garden at our smallholding. 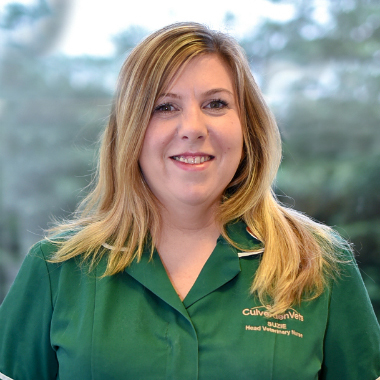 I joined the practice in April 2016 working as an RVN in Tunbridge Wells. 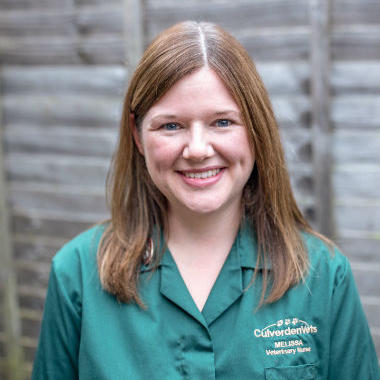 Previously I spent 5 years working in a mixed Small and Large animal practice where I trained and qualified in March 2015. I enjoy traveling to new places and at home I have two cats called Alan and Maggie, who always provide great entertainment. I joined the practice in 2003 at the Crowborough Surgery where I was Head Nurse until 2010, when I left to have children. I rejoined in 2014 and thoroughly enjoy being back at Culverden. I love all aspects of the job. I have a dog, cat, 3 legged tortoise and chickens as well as two young sons & a husband who keep me very busy!! In my spare time I enjoy gardening, films and reading and catching up with friends. 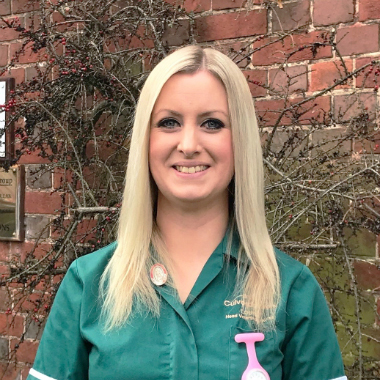 I started my degree in Veterinary Nursing and joined Culverden in 2014, qualifying in 2017. I have always loved animals and have worked with a variety of species in Australia’s outback, as well as volunteering at a local cat sanctuary. At home I have two rescues, a dog called Zola and a cat called Coach who never fail to make me laugh. At work I have a keen interest in behaviour, inpatient nursing, anaesthesia and have a particular soft spot for “bully breeds”. I am passionate about animal welfare and rehabilitation, photography, country music and travelling. I also run the puppy parties in Crowborough, which I I really enjoy! 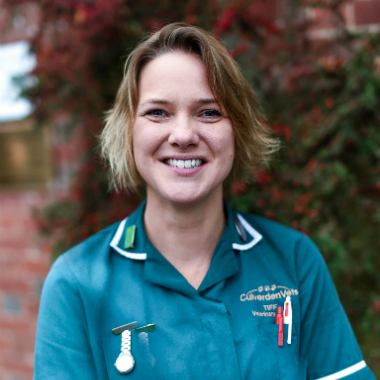 Fiona is an experienced nurse and joined the hospital team in 2017. 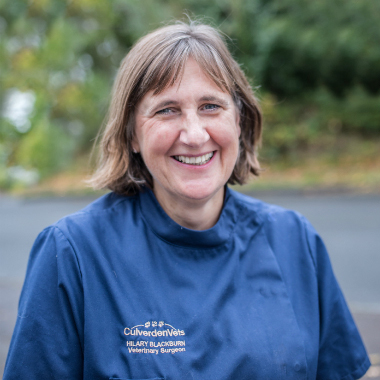 She also runs our Puppy Parties in Tunbridge Wells, having tested her skills on Humphrey, her opinionated Cavalier King Charles Spaniel. Humphrey is a Culverden social media superstar – @culverdenvets. Outside work Fiona is a keen runner. 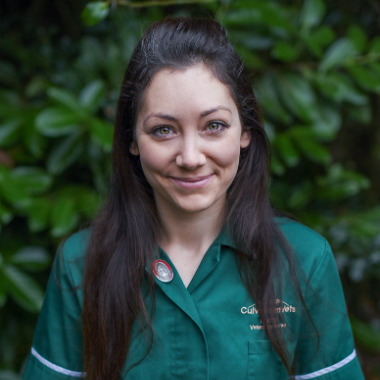 I joined the nursing team at Culverden Veterinary Group in November 2015 as a Student Veterinary Nurse. Before joining the practice I studied and graduated university with a BSc in Equine Management. I have always wanted to work with animals and previously volunteered for a wildlife charity in the local area. Outside of work I volunteer and DJ for a local radio station which is a lot of fun. I have a cheeky rescue cat called Sadie who keeps me very amused! 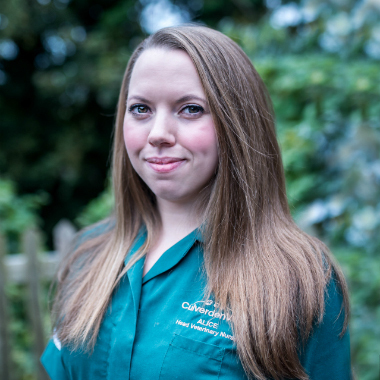 I started my veterinary nurse training at Culverden in May 2017 having previously worked with exotic mammals and reptiles. I’m exciting to be learning new skills and working towards becoming a registered veterinary nurse. In my spare time I enjoy going to the gym and the cinema. I have a working cocker spaniel called Harry. 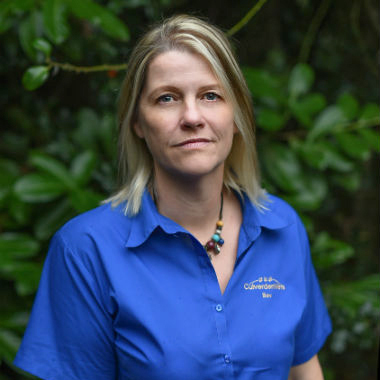 After working with wildlife, I started nursing in 2008 at Culverden and qualified in 2010. After a two year gap having my son, I returned home to Culverden. In my spare time I enjoy artistic challenges, looking after my leopard gecko Genie and my greedy tortoise Evie. 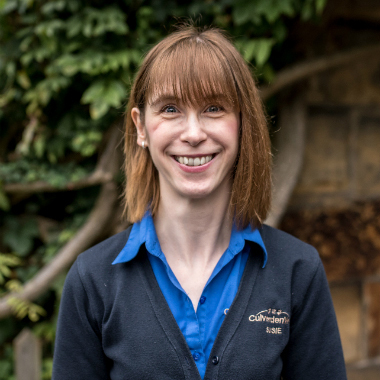 I joined Culverden in August 2014, after qualifying from a small animal practice where I trained for three years. Prior to that, I worked for an animal charity for four years. I own a rescue dog, Zena, who’s quite a handful and with my beautiful son keeps me pretty busy! In my spare time I love horse riding and walking the dog. I joined the practice in 2018 as an evening receptionist. 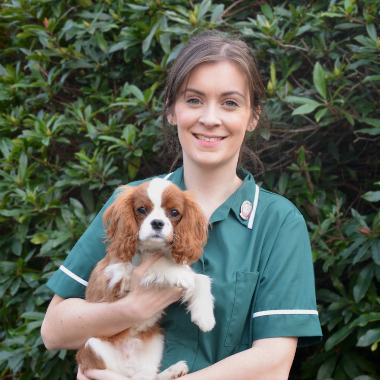 My ambition is to become a Veterinary Nurse and I’m thrilled to have started my studies with the nursing team in Tunbridge Wells. I qualified from Bristol University in July 2014 with a degree in Veterinary Nursing and Bioveterinary Science. 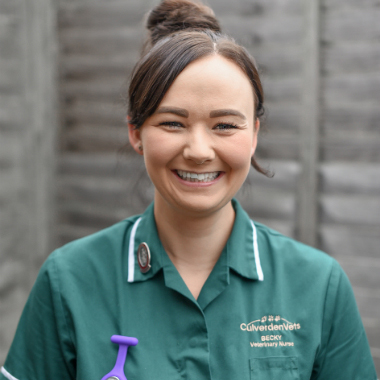 On gaining my RVN qualification I joined the practice and became head nurse in Crowborough in 2016. I have a keen interest in medical nursing and laboratory work. In my spare time I like to walk my chocolate labrador, Cleo. I also have 2 horses, Harvey who came 3rd in the BE90 National Championships in 2013 and Julia who I have broken in myself. 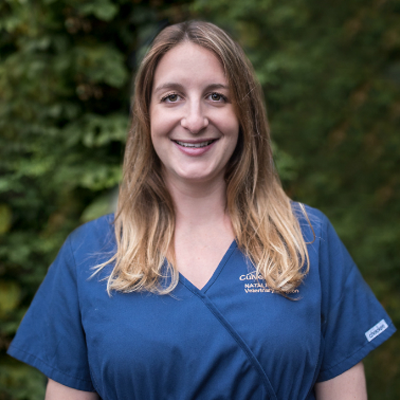 I joined the Crowborough practice in 2002 as a receptionist, before transferring to the Tunbridge Wells surgery to train as a veterinary nurse. I qualified in 2006. In 2008 I went travelling for 3 months, to countries including Australia, New Zealand and Thailand. The highlights of my trip include swimming with wild dolphins, snorkelling in the barrier reef, cuddling koalas and doing a skydive. I then returned to work at the Crowborough surgery in 2009. I have a keen interest in small mammals especially rabbit husbandry and anaesthesia. I also enjoy running nurse clinics and puppy parties. In my spare time I enjoy Zumba, walking, DIY and decorating. I enjoy running the weekly puppy parties! I qualified as a VN in 1996 and have had a varied career! I enjoy all aspects of being a Veterinary Nurse as every day is different. I especially enjoy nursing feline patients. 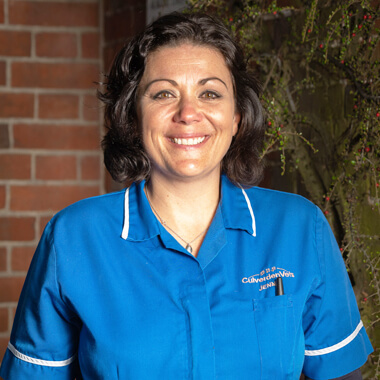 I joined Culverden in April 2018 after spending a number of years at a mixed practice in Hailsham. In my spare time I enjoy running, walking my terrier and riding my horse Melody. 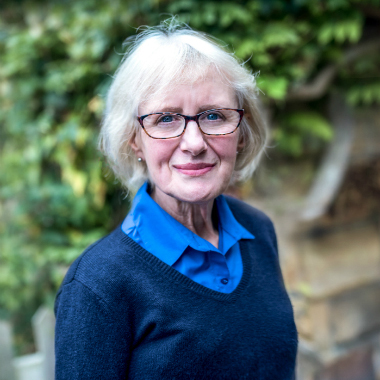 I’ve been with the practice for many years, joining our Tunbridge Wells branch in 2002 to train as a nurse and qualifying in 2006. In 2007 I took a break from veterinary nursing in order to work with special needs children. I returned to work for the practice at the Crowborough surgery in 2010 and came to Wadhurst as head nurse in 2014. I have a keen interest in in-patient care, especially animals undergoing chemotherapy treatment. I also enjoy laboratory work. I am a keen horse rider and a qualified riding instructor. In 2014 I took on a feisty ginger and white stray cat called Charlie. In my spare time I go to the gym, enjoy going with my dad to watch Chelsea play, and love spending time with my two young nephews. I’m very excited to have joined at the team at Wadhurst. 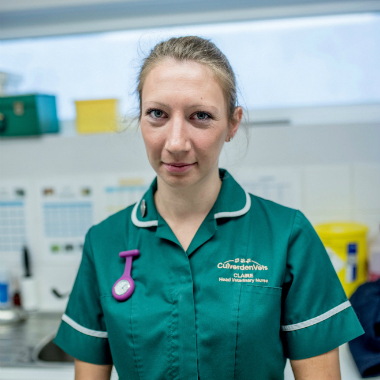 I qualified as an RVN in 2007 and worked in a busy practice in Uckfield before taking time out to have a family. With only the arrival of a few more rescue chickens on the horizon, I’m very much looking forward to getting back into nursing. Our menagerie at home includes: a bouncy chocolate lab, an elderly terrier, 7 hens, one cockerel, 2 pigmy goats, a goldfish and two lovely lively daughters! With what free time I have I help out at Stonegate school, with reading, swimming and gardening club. I really enjoy going to circuit training, running (fair weather only), spending time in my garden (especially the vegetable patch), trips to the theatre, and taking our girls on exciting adventures! We’ve recently discovered a new passion for Norway and skiing. Barbara joined the practice in 1989 and is responsible for all of the accounting and administration for the practice. Her office is hidden out of sight but she pops into reception frequently to say hello to the animals that have come to visit. In her free time, she loves reading historical novels and walking in the countryside. 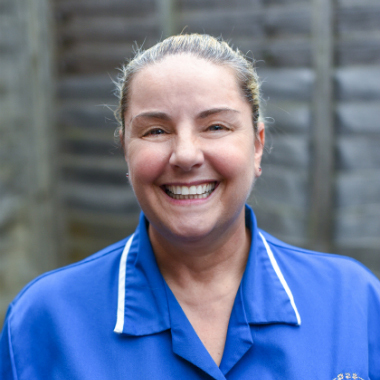 Toad joined the practice in 1988 as a trainee nurse and has been here ever since. 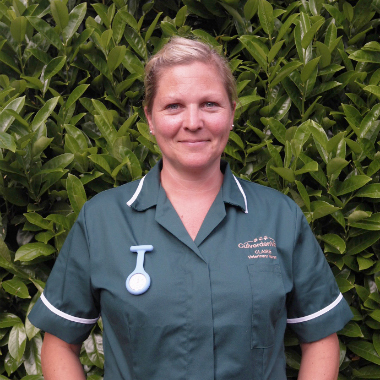 She qualified as Veterinary Nurse in 1991 and has worked at our Crowborough branch and as the Equine Secretary. 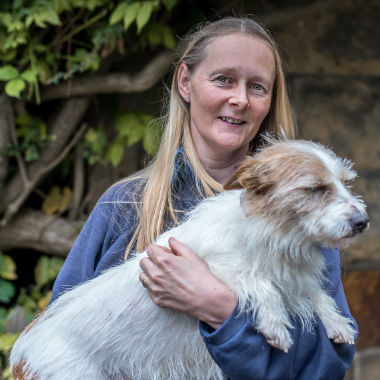 Now she works as the Small Animal secretary with a particular interest in animal exports and she has also taken part in voluntary clinics for The Dog Trust. In her free time, she likes to play the euphonium as well as taking care of her dogs, cats, horses, geese, chickens and pigs. 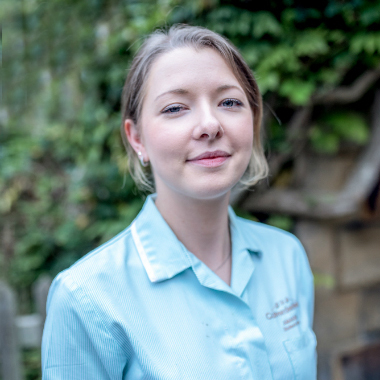 Rachel joined the practice in 2011, after an epic trip backpacking in Australia and then a career as a beauty therapist. She is now one of the receptionists for the small animal department. Rachel’s favourite part of the week is cuddling the new puppies on puppy party day. She likes to Zumba, in her free time and she still does the occasional bit of beauty therapy. She has a gorgeous cat called Maggie. 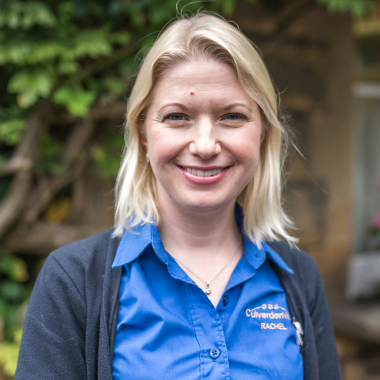 Susie joined us in Tunbridge Wells in 2015 having made a career change from hairdressing. 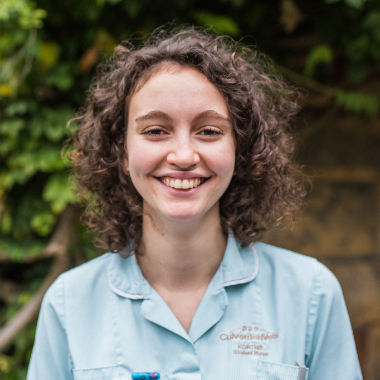 She enjoys drawing and yoga in her spare time, and has a very cute Cavalier King Charles Spaniel cross Bichon Frise (Cavachon!) called Maud. In 2018 I took on Rita, a rescue dog who came to the practice through the RSPCA. She had an inoperable leg fracture and after a lot of Culverden care is thriving on her three remaining legs! 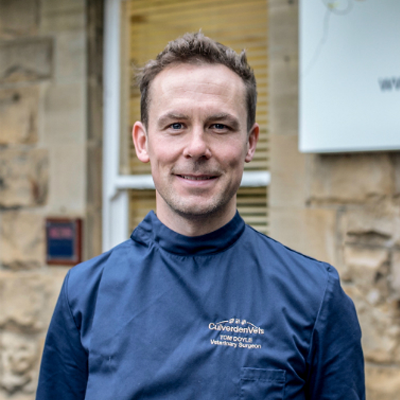 I joined the Crowborough practice in 2006 after previously working at Eastbourne College where I taught hair dressing. My main role at Culverden is receptionist but I also enjoy helping the nurses, joining in the puppy parties and keeping messy vets in order. I’m interested in dog training and behaviour. Outside work my interests include reading and being an active gym enthusiast. I also enjoy computer games (which is the only way I can communicate with my teenage son!). 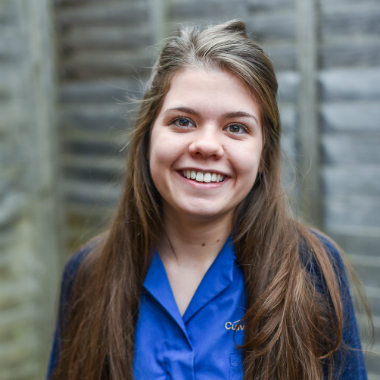 I started at the Crowborough surgery as a work experience student from Plumpton College over 2 years ago. At Plumpton I studied Animal management and Animal Care. 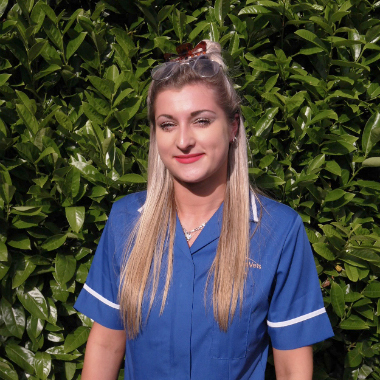 I joined the Crowborough team as a part time receptionist in May 2015. I aspire to further my career and one day become a veterinary nurse. I love walking and taking care of my two corgis. I also love going to the gym and socialising with friends. 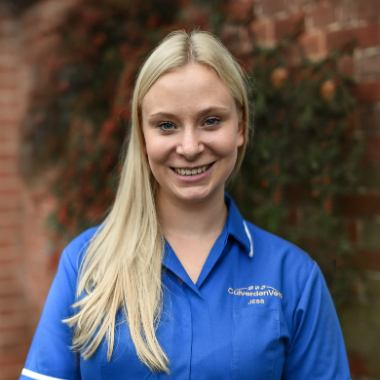 Jess joined Culverden Veterinary Group in September 2013 and works in our Wadhurst branch as a receptionist and problem solver! In her spare time she enjoys walking her dogs Benji, who is a rescue Staffy cross, and Rose, a terrier. She also enjoys spending time with her Irish Sports Horse Kevin, whom she hopes to event when he is older. 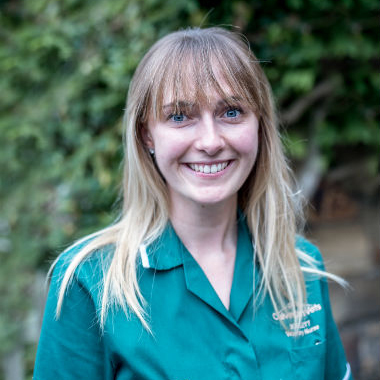 I joined the practice as a receptionist at Wadhurst in January 2018, in order to fulfil a lifelong ambition to re train and work with animals. My own menagerie includes one husband, two beautiful daughters, two rescue cats called Hank and Boris (who have taken up residence in the airing cupboard) and a cheeky little one year old black Jackapoo called Raffa. In my spare time I love gardening, cooking, walking the dog and bird watching. We’re also helped out occasionally by members of the Tunbridge Wells surgery’s nursing team.